"I Did My Bit To Make It Work, With Mixed Results, Up And Down, Good And Mediocre..." PEOPLE! Sometimes Genius Is Modest To A Fault! Sometimes I read books about the people who make comics. These two books were about one man: Alex Toth. Now, obviously Alex Toth doesn't deserve two books. No, he deserves three at least. But only two have come out yet so here’s what happened when I read them and then tried to write about them. 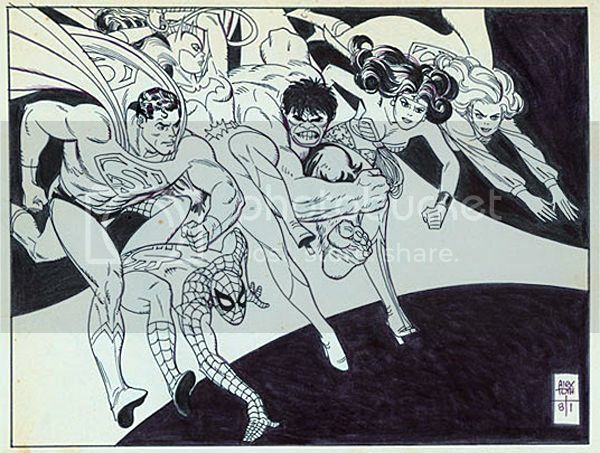 All images are sourced from The Internet and this place in particular was very useful: The Library Of American Comics. These two volumes comprise the first two thirds of a project to detail and illustrate the talent and life of the monumentally gifted, butchly moustachioed and abrasively tempered comic artist Alex Toth. Genius Isolated (Vol.1) was met with much fanfare and fan love on its release in 2011 while the second volume’s reception was so muted I was surprised when it arrived from my LCS (the LCS of the elephantine memory; no pre-order is too “pre” for OKComics!) having not realised it had even been released. Being enormously perceptive I realised this trend replicated that of the reception to Charles Burns’ THE HIVE (also vol.2 of 3; also consistently stunning; also a sort of an open secret). Hopefully, in both cases when the third volumes drop and the trilogies are complete (the prophecies fulfilled; the circle squared; Stella’s groove returned) the welcomes will be somewhat more raucous. This would be entirely natural as completeness does have a tendency to spur consideration. Hopefully, as I say, since at the moment both series are being a bit short changed in the kudos department. That’s okay because I was looking for a purpose in life! So, yes, I read both Toth volumes in rapid succession and then had a bit of a think. This took longer than I expected as that’s a lot of reading to do and thinking’s not my forte. (So apologies for the delay.) Well, I say a lot of reading, but there was also a lot of looking; for while there is a lot of written information here about Toth and his life off the page there’s also a plenitude of his life on the page in the form of his art, and it’s the looking at (basking in) these pages that slows the reading experience to a gentle stroll. A stroll through some of the best comics scenery you’ll probably ever see. If you've exchanged the not inconsiderable (but far from unreasonable) sums demanded for these volumes Toth’s talent probably isn't a surprise. You’re probably already okay about how much of a knack Alex Toth had at the comic book art lark, and you've probably picked them up to find out more about the man. And find out about the man you do. These first two volumes cover Toth’s birth, life, work and death. They contextualise both the man and the art and seek to illustrate, if not explain, the precipitous stalling of his output and his eternal interpersonal difficulties. The Authors have obviously done the footwork, put the hours in, manhandled the microfiche and asked the people who knew and ended up with a pretty good picture of the man who drew all those lovely, lovely pictures. While it’s hardly The Running Man it’s no mean feat for Mullaney & Canwell to make the text as interesting as it is. This is, after all, the story of Alex Toth, which is basically the story of a man who sat in a chair smoking and drawing for several decades. 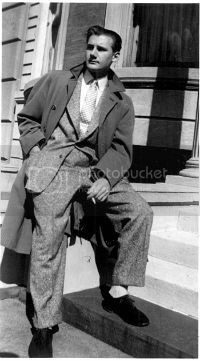 His biographers aren't helped in the last stretch of Toth’s life when he packs in his nasty habit and spends most of his time just sitting and smoking. (AKA Living The Dream!) Luckily they have nous enough to realise that this long stretch of very little is a bit of a Mystery and there’s quite a lot of trying to pin down exactly why someone so gifted, so feted and (unusual for comics this) still in demand despite his age found it so hard to produce anything for so long. Toth has the obligatory odd relationship with his mother, a mysteriously detail light (particularly given the obvious research) early marriage, an army stint, alimony, children…basically a Life much like many others. There’s no smoking gun to be found, there’s no childhood encounter with a man in the park, no hiding under a pile of corpses, no secret love of show tunes, just a Life. A life with ups and downs and a marked decline in productivity somewhat sooner than might be expected. Personally, I think he just burned out early. Toth was ridiculously concerned with producing the best art he could and that’s not the best way to achieve longevity in comics. Quantity first and, hopefully, then quality; it remains the same today. He would constantly give his contemporaries (Kubert, Kane, Kirby, possibly even people whose names began with another consonant) grief for their shortcuts and shorthand, apparently ignoring the fact that sometimes you just have to draw someone walking down the street and you aren’t always going to look for a unique way to do that. Except Toth would, and I think eventually he ran out of ways to draw the same things in new ways. Hence his later preference of pin ups over sequential art. Eventually Toth was a victim of his own dizzyingly high standards; finally he found even his own work unworthy. Or maybe not. As I say, comics has always rewarded quantity and it’s hard to see how Toth could have made a living given the ever decreasing volume of his output. Luckily back then comic artists had two escape hatches – syndicated strips and animation. (Sure there were also the old standbys of insanity, alcoholism, prison, suicide, politics and the foreign legion but those options are open to all of us rather than being exclusive to comic artists.) Syndication was the Golden Ticket; syndication was the one they all wanted. As TV is to today’s comic writers so was syndicated newspaperstrippery to yesterday’s comic artists. Joe Kubert had TALES OF THE GREEN BERETS, Jack Kirby had SKY MASTERS, Gil Kane had STARHAWKS and none of those, absolutely none of them, despite all the talent involved, are why those guys are remembered in all our hearts with more love than we afford members of our own family. It was a tough gig to get, syndication was, and I emphasise it only to show how the book implicitly demonstrates how the market has changed (Newspapers? Print? Eyes?) But I have also used it as an act of cheap misdirection because it wasn’t syndication but rather animation which may have saved Toth from wrestling with rats for scraps. As cheap jack and shoddy as those productions may appear now their impact on young minds is undeniable. While SPACE GHOST means the most to most people it means nothing to me. I’m not having a pop at it I just have no memory of it. However…however finding out that Toth designed the cartoons on The Banana Splits caused an explosion of fizzy and not entirely unpleasant associations from my childhood to sparkle briefly before swiftly dying in the infinite night of my mind. Toth’s influence and appeal went far beyond comics and the emphasis (an entirely natural emphasis) given to the sophistication of his artistry should never overshadow the simple fact that his work never disdained his audience. Popularity and appeal were at the core of Toth’s work. The complexity of his techniques was entirely in thrall to his desire to communicate with his audience in the most direct manner possible. While the comics cognoscenti and the artistically educated will always, rightly, laud the technique, Toth’s (eternal? TBC!) popularity is due to this desire to be universally understood, to be enjoyed by anyone and everyone but never at the cost of his art and certainly never, ever by pandering. This art, intended for all but unique only to Toth, is plentifully and beautifully reproduced on the pages of both books. The one exception would be the Jon Fury pages which look like they have been reconstructed from pages on the verge of disintegration. Indeed this turns out to be the case; here posterity trumps prettiness, but everywhere else the art is reproduced to startling standards and is a representative mix of original pencils and printed product. 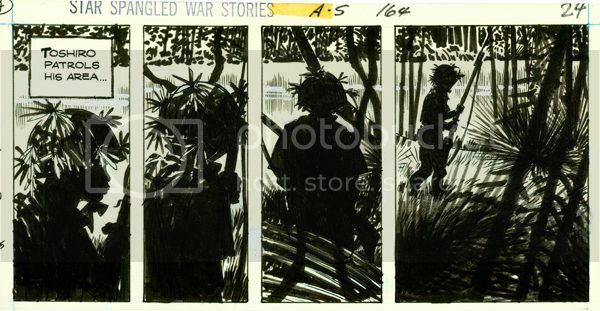 Seeing The Crushed Gardenia pages in the original B/W shows just how much Toth was anticipating the colour used in the final version to complete his work. Drawing in B& W and drawing for B&W, Toth knew, are very different. All the art here is informative, educational and just plain enjoyable. Most of the credit is, of course, Toth’s but there’s a lot of credit due Mullaney & Canwell for sourcing it all and presenting it so attractively. Now, while these books are perfectly enjoyable in and of themselves they can be enhanced by also dipping into ONE FOR THE ROAD (Auad, 2001), SETTING THE STANDARD (Fantagraphics, 2011) and ZORRO: The COMPLETE ALEX TOTH, Image, 2001). These are all easily available and the STANDARD art documents a period for Toth of incredible output where quality was married to quantity and the great and sympathetic inking of Mike Peppe is seen at full force. The ZORRO book is generally agreed to be Toth’s greatest sustained burst of solo art and has even had grey tones reworked by Mr. Toth, thus making it as Artist Approved as anything by Alex Toth is ever likely to have been. The ROAD book collects a fat wodge of neglected strips about cars, surfing, girls, girls and, indeed, girls etc. where the free reign given to the artist results in Toth unclenching somewhat and producing some of his most innovative and exuberant work. I would like to recommend a volume showcasing his DC work but until DC produces one I can’t. So, yes, visually, as befits books about Alex Toth, these are some handsome volumes right here. Beyond the art there are also pictures of the man. And if the number of photographs is surprising then the number of them on which Alex Toth is clearly happy is a revelation. Given Toth’s reputation as a curmudgeon non-parallel it’s important (and pleasant) to remember that sometimes his temper took time off and he was a normal person; one remembered as cheerful, funny, helpful and generous. Until he wasn't. It’s pretty obvious Toth had some problems and I’m no more going to pop psychoo-analyse him than the authors do. He was what he was and the nearest we can get to that is via the testimony of those who were there. And as I say, he seems like a nice man most of the time but, obviously, the other stuff remains more vivid and it all gets one more go round, a definitive go round given the authors’ thoroughness. There’s the Julie Schwartz Spat, the Kubert and the Art in The Car Boot Debacle, all the timeless standards and family favourites collected for all time in one place and extra bonus! - a whole bunch of new people who Toth just cut off contact with because, well, because he could be a bit of a bear with a sore arse sometimes. But that’s a perhaps ungenerous and certainly one-sided way to remember Alex Toth and to their credit the authors make a concerted effort to show Toth finding a bit of light in his life towards the end with reconciliations and concessions raising up once more many of the bridges once thought burned beyond repair. It’s a biography not a comic so Toth still dies at the end, but the reader has a sense that he died well and with a measure of peace; a measure he would probably have never expected. I’d count that as a happy ending as far as these things go. Even happier, Alex Toth’s life and work are celebrated in his absence by a series of books which, thus far, are VERY GOOD! 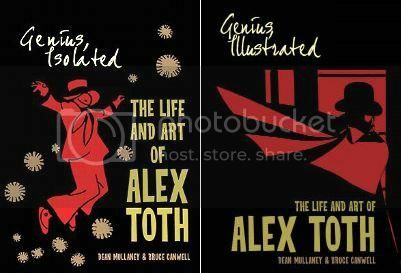 The forthcoming third volume GENIUS ANIMATED: THE LIFE AND ART OF ALEX TOTH will apparently be a dedicated art book showcasing model sheets and presentations for the many animated series Toth worked on or pitched. That’s going to be something to see even though it isn’t strictly speaking - COMICS!! !